Step #2 Measure for side room. 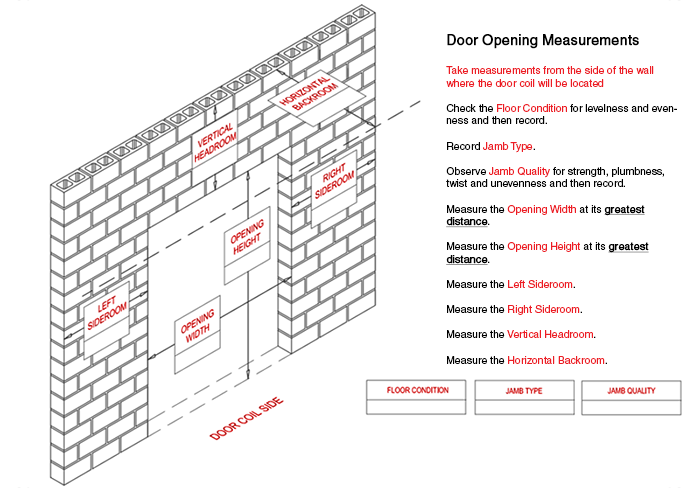 4" - 9" (depending on door) is required on each side between the opening and the wall or other obstruction for installation of the vertical track, this area needs to be capable of flush mounting the tracks and clear of any obstructions. See Check Clearance page. Step #3 Measure area labeled "headroom". Head room is thedistance between the top of the door opening ("jamb header") and the ceiling (or ceiling to floor joist) 15 ½” of headroom is required for a 7’ and up, 7’ to 8’ 8” requires 16” of headroom and 8’ 9” to 10’ requires 20” headroom (examples taken from model 650, check other models for their headroom requirements). Step #4 Measure area labeled "back room". Back room is distance is measured from the door opening toward the back wall of the building. 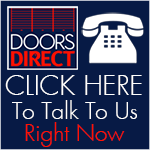 If you have any more questions about measuring for your door, one of our Doors Direct specialists will be happy to help you.